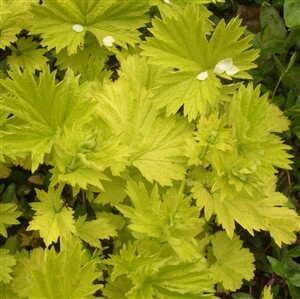 Geum 'Eos' A stunning new introduction, the bright sunshine yellow foliage makes a fantastic back drop for the brilliant orange flowers which are freely produced in spring and early summer. Excellent on heavier soils in sun or light shade. Lights up shady places but flowering will be diminished.